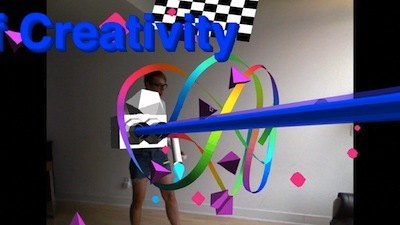 Jeremy Bailey’s performance-oriented practice centres around the use of custom augmented reality software which overlays graphics overtop the photographic image. 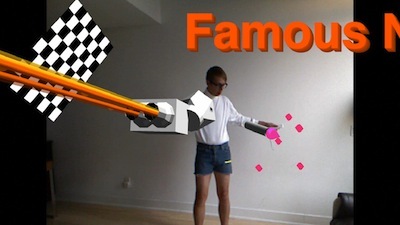 In Explore the Future of Creativity, Bailey has produced an advertisement for “Famous New Media Artist Jeremy Bailey”. Bailey’s ad, designed for presentation on large scale public screens, runs concurrently with an external advertising campaign on Google adwords and YouTube. The work explores the urban screen as a commercially-driven element of public space and extends the urban screen to include the small, mobile, personal and social screens of our other devices. Bailey uses the aesthetics of the Internet and the perpetual cartoon “now” to interrogate relationships between cultural and commercial contexts and to challenge expectations of both advertising and art within the frame of contemporary global media culture. Jeremy Bailey is a Toronto-based new media and performance artist whose work explores custom software in a performative context. Recent projects include performances at the Tate Liverpool and the New Museum in New York.